Day To Day Coffee Is 100 Percent Pure Coffee Made From Premium Arabica Coffee Beans. 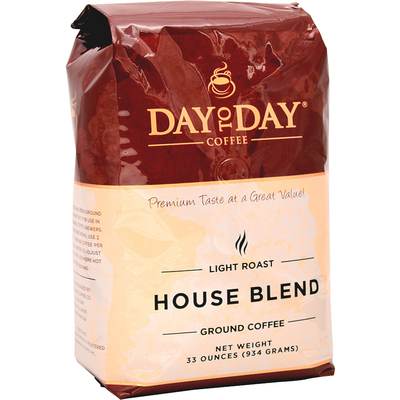 Coffee Connoisseurs Will Appreciate Its Sweet, Rich Aroma, Mild Roast And Palate-Pleasing Taste Of This House Blend Flavor. Coffee Beans Are Ground To Be Used In A Drip-Coffee Brewer. Coffee Is Packaged In A 33 Oz. Bag To Last Longer And Deliver Great Value..
Day To Day Coffee Is 100 Percent Pure Coffee Made From Premium Arabica Coffee Beans. Coffee Connoisseurs Will Appreciate Its Sweet, Rich Aroma, Mild Roast And Palate-Pleasing Taste Of This House Blend Flavor. Coffee Beans Are Ground To Be Used In A Drip-Coffee Brewer. Coffee Is Packaged In A 33 Oz. Bag To Last Longer And Deliver Great Value.